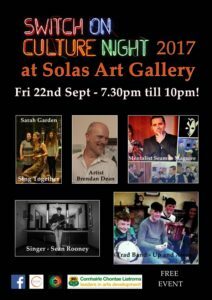 Its all happening in Ballinamore on Culture Night Friday 22nd September. I am kicking off the evening with Sing Together from 7.30pm. Its free so come and BRING A FRIEND! And then afterwards Brendan Dean will give a talk about his fantastic exhibition currently displayed in the Gallery. Not content with that, Mind Artist Seamus Mcguire will mess with your perceptions, in a fun way of course, Sean Rooney will entertain us performing his songs and to end the evening we will have some feisty trad with young band Up and Away. There will be refreshments served. As there is limited seating get there early!